With six events set to run inside nine days this September, ULTRA Worldwide is shaping up for one of the biggest months in its history. With elements of the lineup for Hong Kong, Japan and Singapore already confirmed, the festival behemoth can now reveal their lineups for Road to ULTRA Taiwan, ULTRA Beach Bali and Road to ULTRA Philippines. Having launched their eight-stop Asia tour back in June at ULTRA Korea and a SOLD-OUT crowd at Road to ULTRA Thailand, ULTRA Worldwide’s extraordinary journey will continue on September 11, 2016 at the iconic Da Jia Riverside Park in the heart of Taipei City for the second annual edition of Road to ULTRA Taiwan. Afrojack and Alesso will return to the bustling capital city along with deadmau5, DJ Snake and W&W, rounding off an unforgettable night that’s not to be missed. Support will come from Quintino and Raiden. With Tier 1 tickets already sold out and Tier 2 tickets in very limited supply, be sure to grab yours before it’s too late. 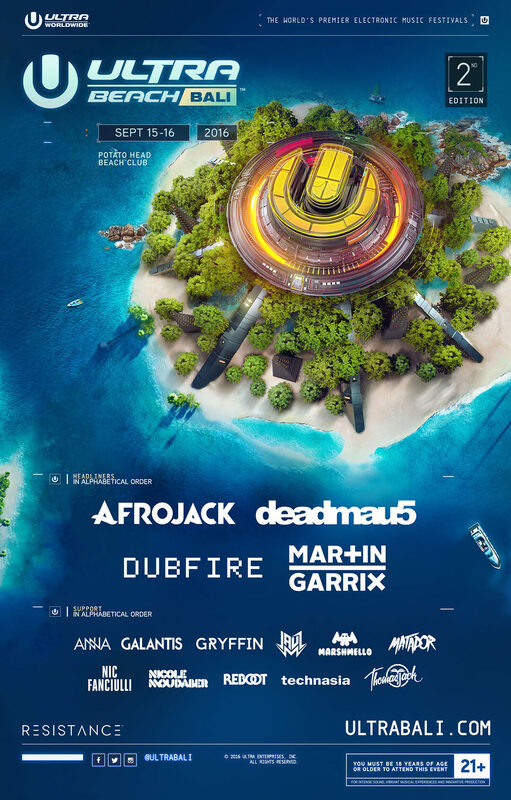 Next up on the tour will be one of the most anticipated stops of this circuit – the two-day ULTRA Beach Bali. Hosted again at the idyllic Potato Head Beach Club in Seminyak on September 15-16, the venue will feature three of the most diverse stages in electronic music, with ULTRA’s Main Stage, RESISTANCE Stage and UMF Radio Stage. Headlining proceedings across the two sun-soaked days will be Afrojack, deadmau5, Dubfire and Martin Garrix. Support comes from every genre imaginable, in the form of Anna, Galantis, Gryffin, Jauz, Marshmello, Matador, Nic Fanciulli, Nicole Moudaber, Reboot, Shaded (live), Technasia and Thomas Jack. With Early Bird tickets for the event selling out instantly upon release, snap up the last remaining Advance Tickets that are on sale now and priced at IDR 2.300.000 ($177 USD). Following on from Bali, the second to last stop on the gargantuan tour will be at the ‘Pearl of the Orient’ for Road to ULTRA Philippines. Taking place at the colossal Mall of Asia Concert Grounds in Manila, the official headliners for the returning event will be Alesso, Hardwell and Tiësto. Complete with support from Fedde Le Grand, Moti, each will be bringing their wealth of experience and huge catalogue of hits, for what is set to become one of the largest electronic music events the city has ever seen. Local acts include Jessica Milner, Raiden and Tom Raus. Tickets for RTU Philippines are currently on sale and priced at PHP 3,000 for General Admission and PHP 5,000 for Premium General Admission.